Buying a home in the DC metro market requires an understanding of not only the seasonal shifts in market activity but also the weekly flow of the market. You’ll need to understand that there are two cycles – both a yearly one and weekly one when looking at homes. And you’ll need to be prepared and know what to expect for each one. One simple way to explain these cycles is with a surfing metaphor: It’s like knowing the best time of day to catch the best waves or whether to wear a wetsuit at certain times of the year. Just like a surfer hitting the waves, you start to know what to expect and know what time you need to be out there to get the best outcome. It’s a huge lesson for buyers to know that they’ll need to adapt and be flexible. We can’t emphasize enough that you’ll be a successful and less stressed buyer if you know how to respond to the cyclical flow of the market — both seasonal and weekly. Homes tend to come on the market Thursday and Fridays. As the weekend approaches buyers have time to devote to their home search. Makes sense! What that means is, depending on where you are looking, sellers either tend to take offers quickly OR they set deadlines after the weekend to give as many buyers a chance to see their home, hoping to get multiple offers and drive the price up. If you see a home you like online, reach out to your agent and flag the listing so your agent can reach out to the seller’s agent to see if you need to rush out to see it and go for speed, or if you can take your time and have a set deadline, typically for early the following week. There are exceptions to this rule, but typically, this is how the weekly cycle of new listings works. Inventory (the number of homes on the market) in the DC area has a yearly cycle that looks like a bell curve with the low periods in January and December, and the height of the inventory peaking April through June. Suburban homes follow the school calendar and tend to become available in April/May/June. Hardly any suburban homes come on the market at other times during the year. What’s this all mean for you? Go with the flow! If you are starting your search in December, January or August, be prepared that there won’t be that many homes to see. If you can be patient and wait it out until March, April, May or June, you’ll have plenty to choose from. That’s why you don’t want to get frustrated or give up on your dream to own a home if it’s simply timing that’s not on your side. There are exceptions to every rule, so if you want to know what to expect for your own home search, get in touch with us. We can help you with your specific situation. It’s not one-size-fits-all and there are not hard rules, just trends to keep in mind. Let us know what you are looking for and where you would like to live. We can get you started on your search and help you finetune it to your needs and budget. That way you’ll know what to expect and avoid any anxiety about your search. “Chillax” and ride the wave of this great DC metro market! Let us show you how. 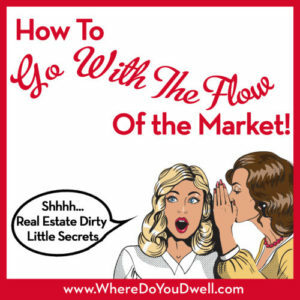 Next up in our Dirty Little Secrets for Buying a Home series is a must-read – What NEVER to Do Before Buying a Home. These tips will save you a lot of grief!